Tap, tap, tap. Anyone out there? Does anyone read blogs anymore? I’m just wondering… I haven’t been able to keep up. School sucked all the energy out of me this last year. Here it is summer again. My list of things I want to accomplish is a mile long! I have missed my sewing machine. You can imagine. The first thing I did after the semester finished was to design this row called “Tree Farm” for my local quilt shop, Gathering Fabric. The shop is participating in the Row by Row Experience for the third year. They always have so much fun playing with the themes. This year’s theme is “On The Move” and reflects the agricultural aspect of Woodinville’s Sammamish Valley. I hope you get a chance to stop by and participate in the Row by Row Experience. Slowly, I am getting into a groove and hope to finish a bunch of UFO’s that have been languishing in my closet. This was my design wall last week. Upper left is The Local, a BOM through Intrepid Thread. I think I am more than a year behind! Below that are some pinwheel blocks that I started over Christmas break. Below that are some U.S. Map blocks using up some scraps from the Deco State fabrics designed by In The Beginning a couple of years ago. 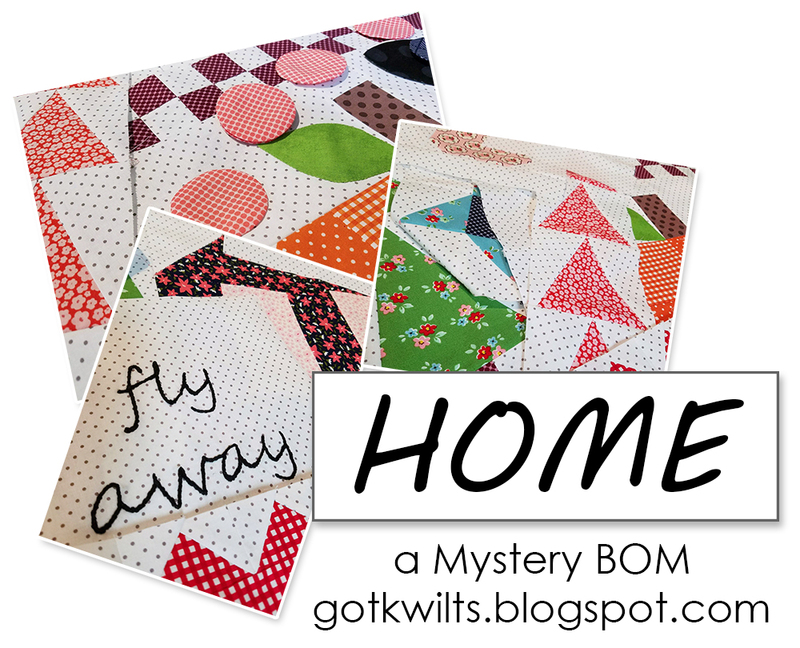 In the upper right is Fly Away Home, a BOM that I designed for Richla of Got Kwilts and Ellen of the Grip & Stitch Discs for free-motion quilting. The BOM will be ending later this summer and I want to try my hand at self-publishing a booklet. Keep your eyes open for more info on that. Well, summer has gone and autumn is in full swing. Autumn is my favorite time of the year! Here are some of the highlights from summer. It looks like I did more knitting than sewing, mainly because it is very mobile. We visited the Grand Canyon, and many of Utah’s state parks along the way, in May. We visited my family in August as well as a camping weekend with friends. I seemed to accomplish more knitting than sewing. But I did finally finish my Merry Merry Snowman quilt and it is in the queue at my long arm quilter. 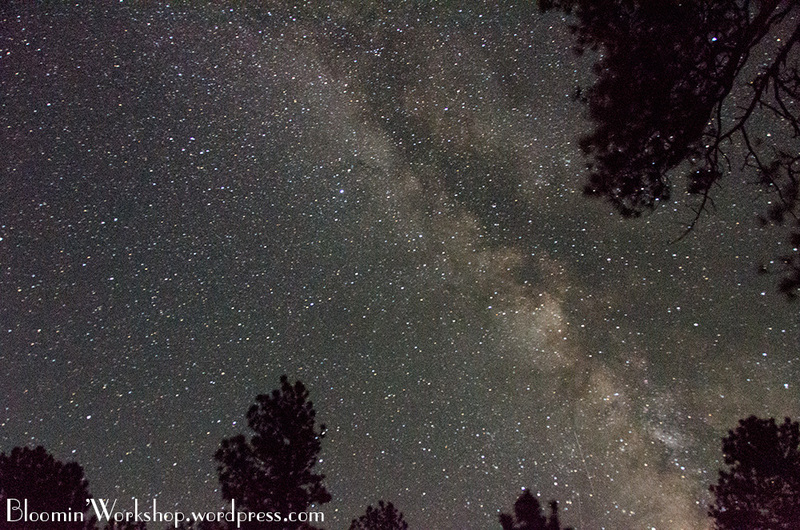 Above is the night sky at the North Rim of the Grand Canyon. It took our breath away! 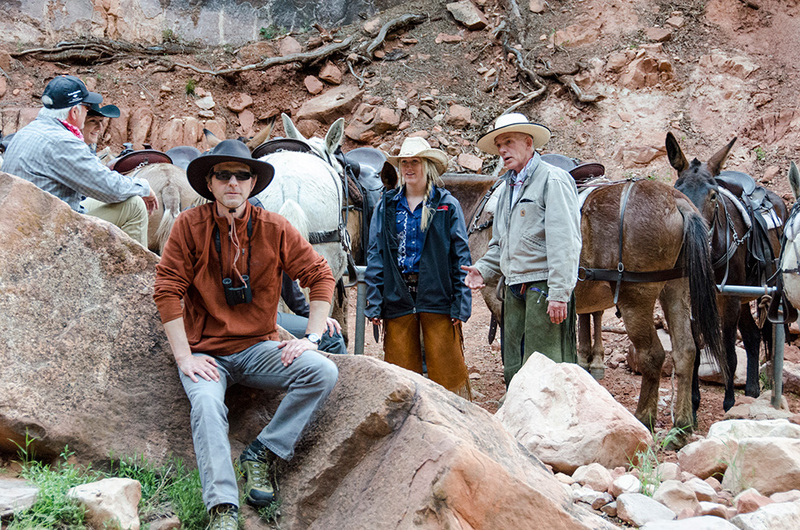 We took a 3-hour mule ride into the Grand Canyon. We got rained on and were quite sore the next day. But it was fun and worth it! 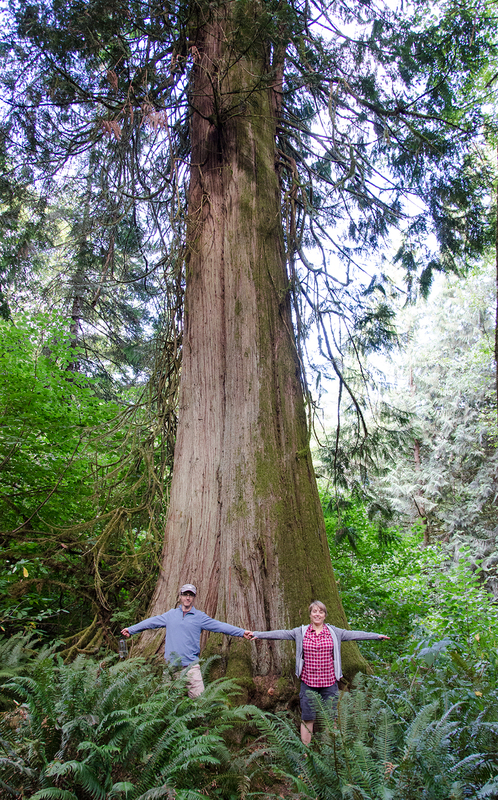 We spent our anniversary on Lopez Island, biking around the island. It was heaven! My knitting matched the sea. 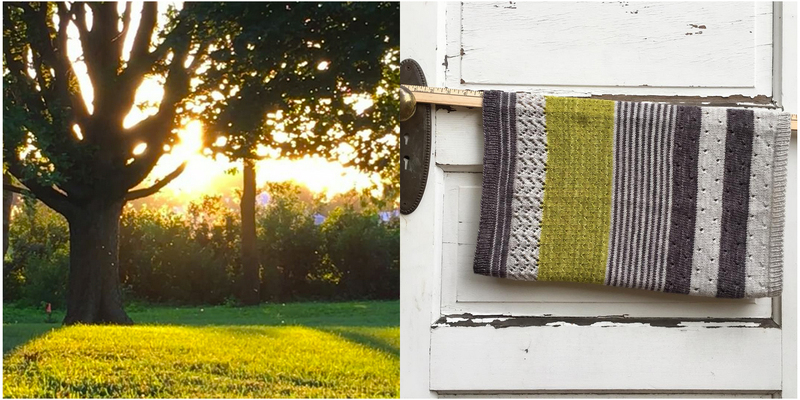 My second 3-Color Cowl matches the color of the grass on my dad’s farm as the sun was setting. The first one that I knit was pink and was a great road project while driving to the Grand Canyon and back. 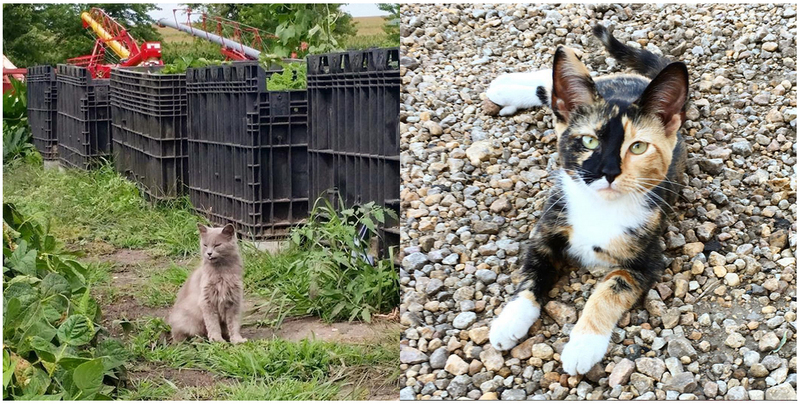 One of my brother’s farm cats and one of my dad’s farm cats. They are such characters! I never thought I would say this, but I miss the quiet of the farm. Maybe we will live on a small farm around here someday. We had some good lightning shows while visiting my dad. I kind of miss these. We rarely get any sort of lightning out here. A peaceful weekend camping at the Lewis & Clark State Park with some friends. Life has it’s ups and downs and I never know how much to say on a public forum. It seems better to just highlight the good stuff. School is giving me a challenge this semester as well as my thyroid. I’ve had Hashimoto’s Hypothyroid for the last 20 years and my doctor has been changing my medication. Ugh. I sort of miss blogging, but don’t really have much time for that right now. Plus, It feels like everything has already been said in the plethora of blogs out there. What do you like to see in a blog? The first month of the Fly Away Home BOM is underway. My quilty friends, Richla and Ellen, are hosting it. 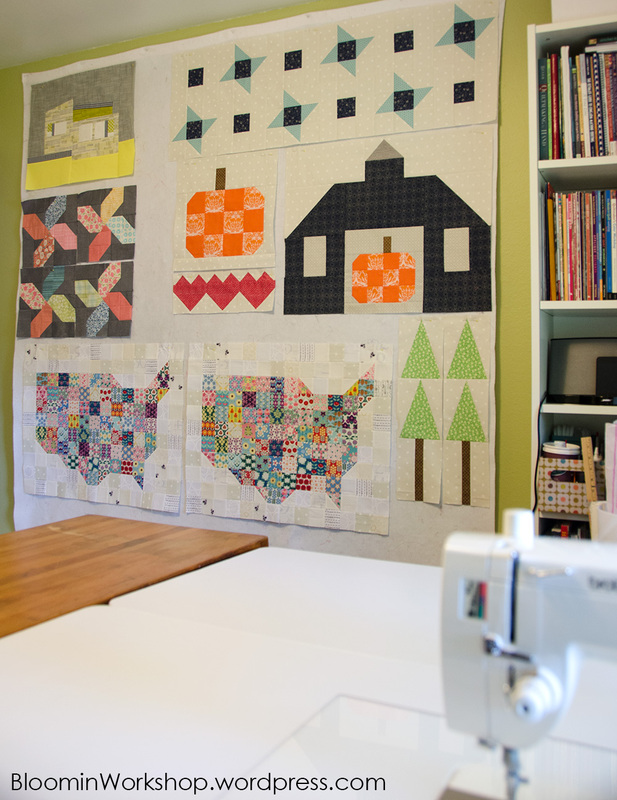 Richla is a longarm quilter and she has quilted some of my quilts. 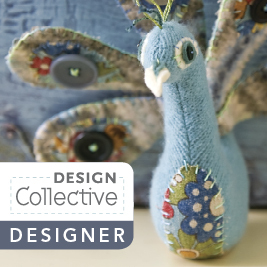 Ellen is the creator of the Grip & Stitch free-motion quilting disks. Last spring they asked me to design an exclusive mystery quilt block-of-the-month program for them. This month everyone is making stars and dots! What could it be?? Well, that is the mystery. You won’t know until the very end. The fabric is all from Riley Blake and many of the fabrics are part of the Posy Garden collection by Carina Gardner. If you missed the initial sign-up, never fear! Richla and Ellen don’t want you to miss out. They are making arrangements to add a few more people. Go to Richla’s blog for more information, or email her directly to sign up. I hear that everyone is having fun making blocks and there will be awesome giveaways to boot. 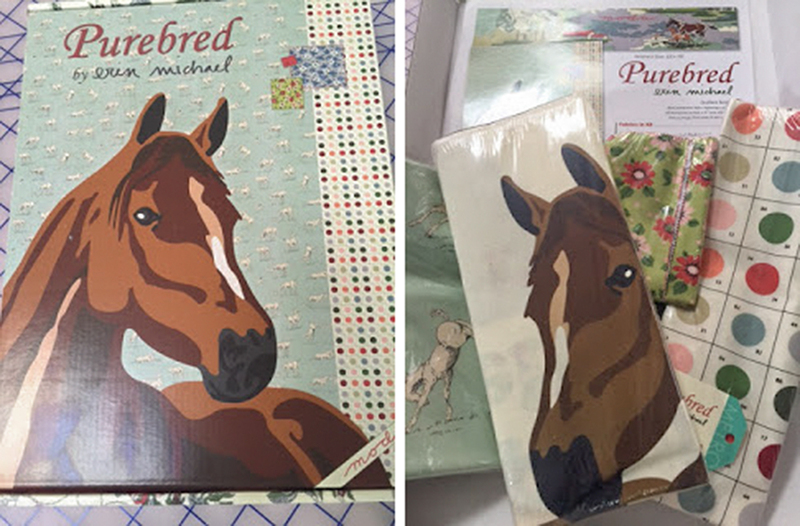 The first giveaway is this fantastic kit, Purebred by Erin Michael. But to win, you have to play. 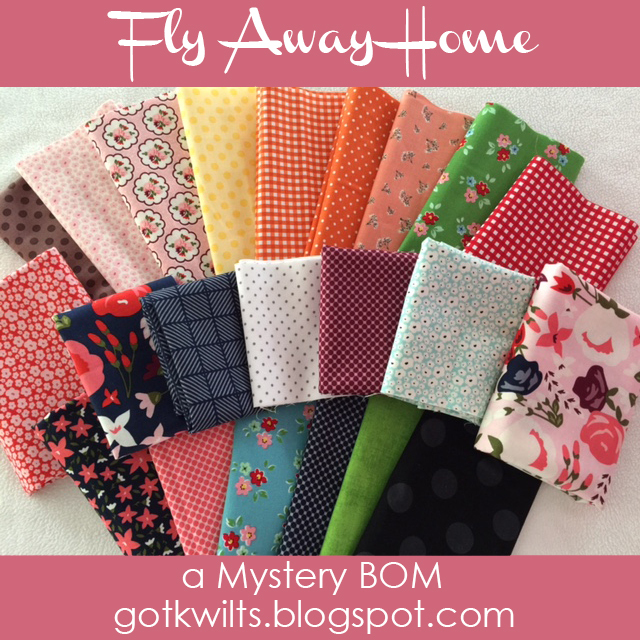 Be sure to post your progress on Instagram and hashtag your photos with flyawayhomeBOM. I made this quilt several years ago intending to write a pattern. After awhile, I waffled about finishing the pattern because it seems sort of easy and there are a million patterns out there already. I had big plans this summer to catch up on so many things. To finish writing patterns was one of my goals. I’ve sort of been moving at a snail’s pace, but maybe that’s okay. Never-the-less, I finally finished the pattern. The pattern is for sale on Craftsy. 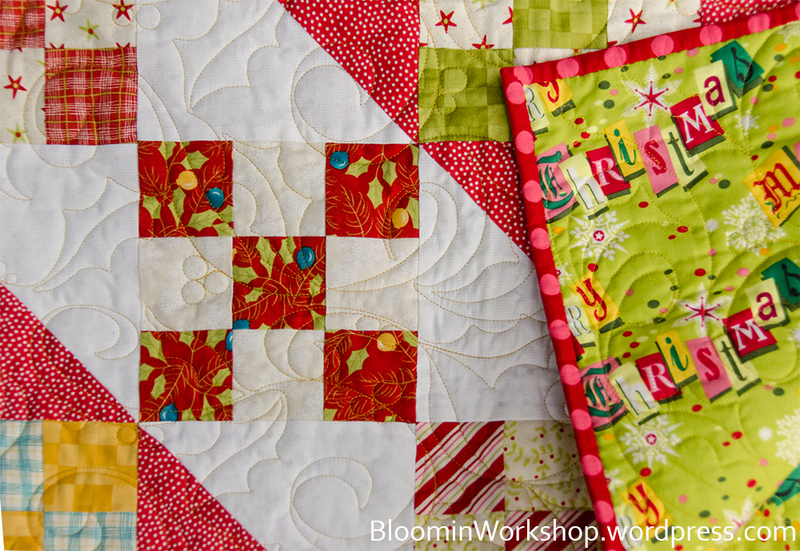 The 9-patches are made with a Jelly Roll (a package of 40 – 2 1/2″ cut width-of-fabric strips). Most of the fabric manufacturers now offer Jelly Rolls (originally named by Moda) or something of an equivalent. Here’s a blog post that describes all the different pre-cut fabric packages available, in case you were wondering. 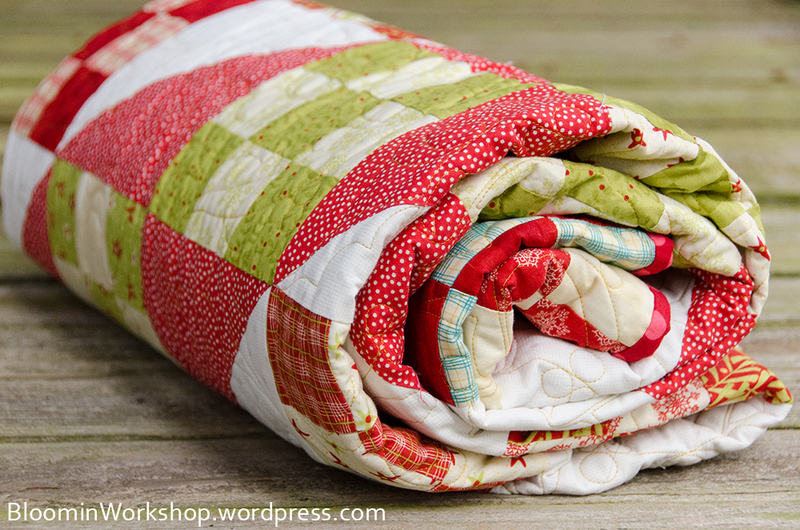 It can be kind of confusing if you are new to quilting or the quilting world. 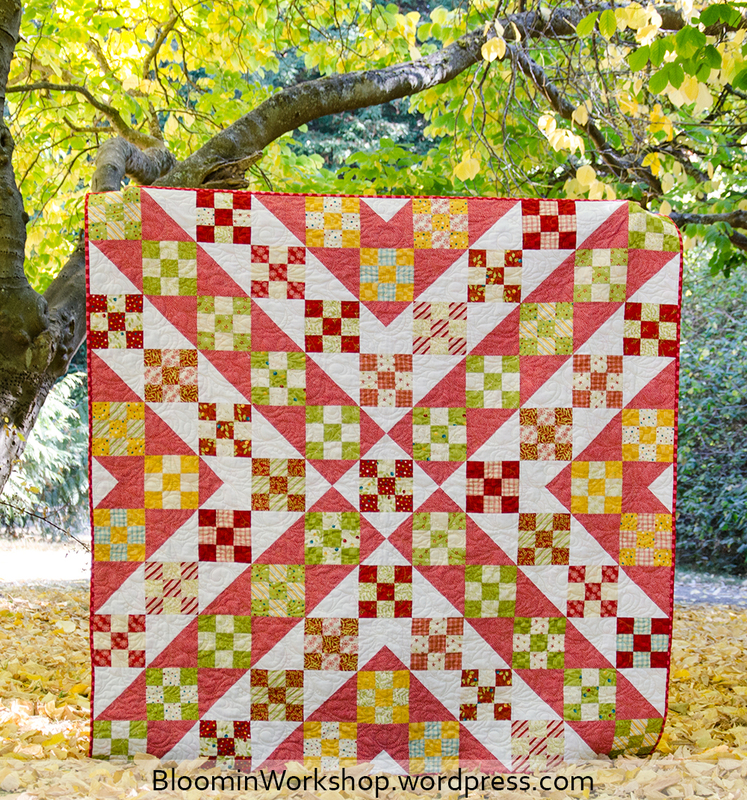 Even though I made this quilt using Christmas fabric, it looks more autumnal to me. And Autumn has definitely arrived in the Pacific Northwest. We have had several good rains already. The leaves are starting to turn. It sure feels crisp in the morning! I’m ready! I love sweaters and scarves and crunchy leaves and pumpkin everything. It’s my favorite time of the year! 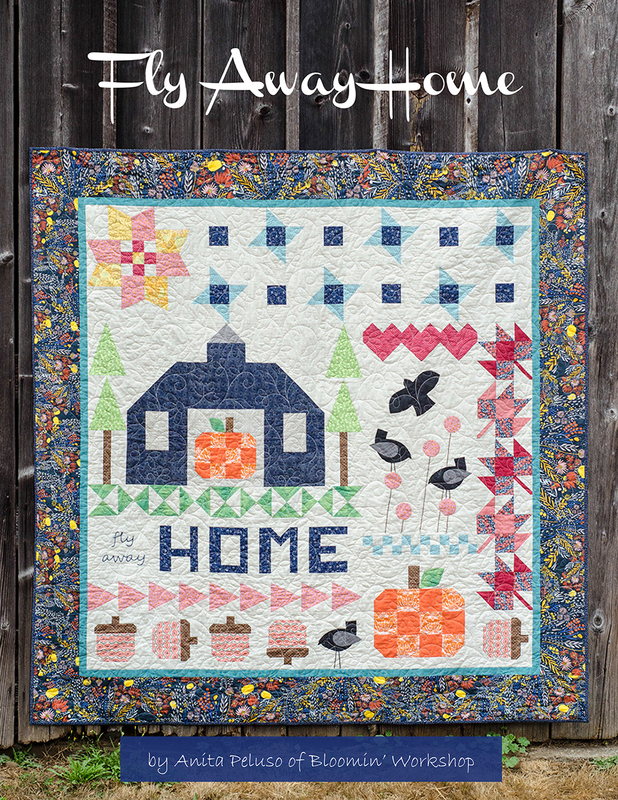 Here’s a sneaky peek of the Mystery Block-of-the-Month called Fly Away Home that my friends Richla and Ellen are hosting. 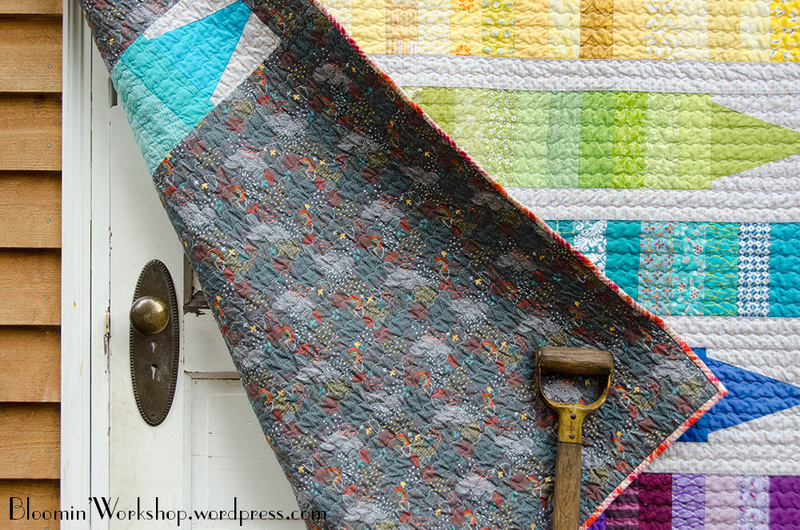 The BOM starts in September and features some really fun Riley Blake fabrics. They asked me to design a one-of-a-kind quilt for them, not to be found anywhere until September 2017 when the mystery is revealed and the quilts are finished. Spots are running out so head on over to Richla’s blog for all the details! 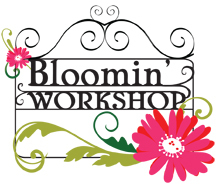 You won’t want to miss out on this chance to sew along! 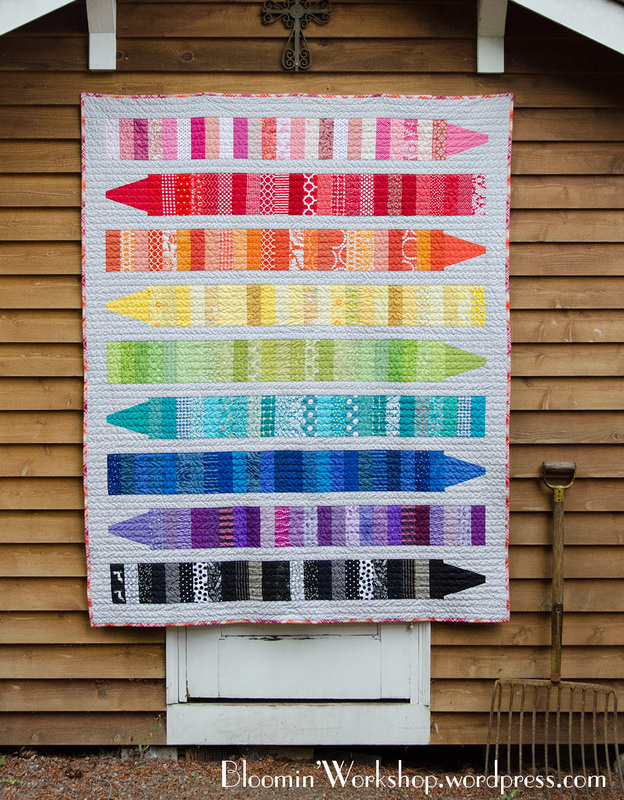 My friends Richla and Ellen are going to be hosting a Mystery block-of-the-month starting in September for which they commissioned me to design a quilt, a one-of-kind quilt that won’t be found anywhere else. We are excited about this collaborative effort! Sign ups are happening right now, so if you are at all interested…. go check out the details on Richla’s blog. All the fabrics are from Riley Blake and the main theme fabrics are part of the Posy Garden collection. 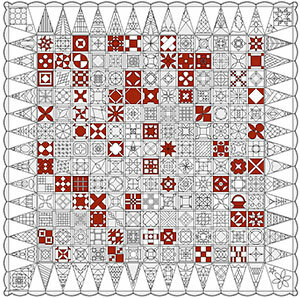 The pattern was designed with the intermediate quilter in mind. An advanced beginner will be pushed out of their comfort zone and challenged to improve their skills. 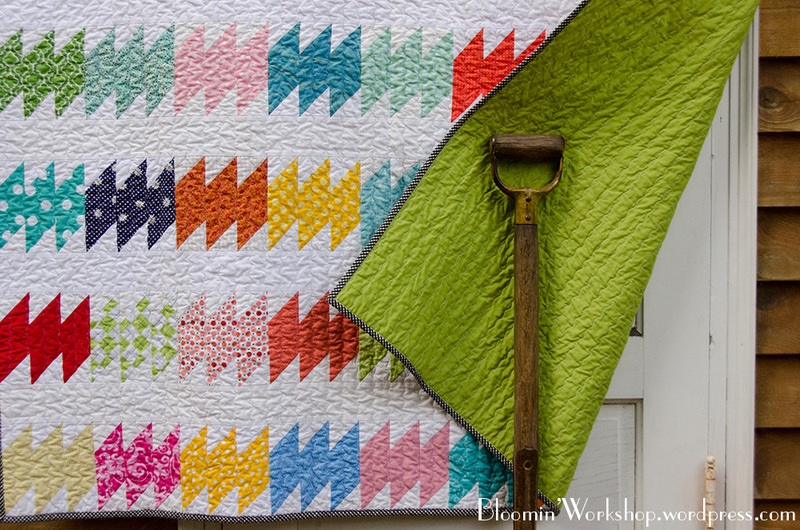 Advanced quilters will not be bored with the variety of techniques that will be explored. I hope you will join us! Woosh! And just like that, the summer came and went. I had such grand ideas and such small accomplishments. My number one goal was to finish these quilts that were made with the women from the Faith Circle of Do.Good.Stitches, a quilting bee on Flickr. 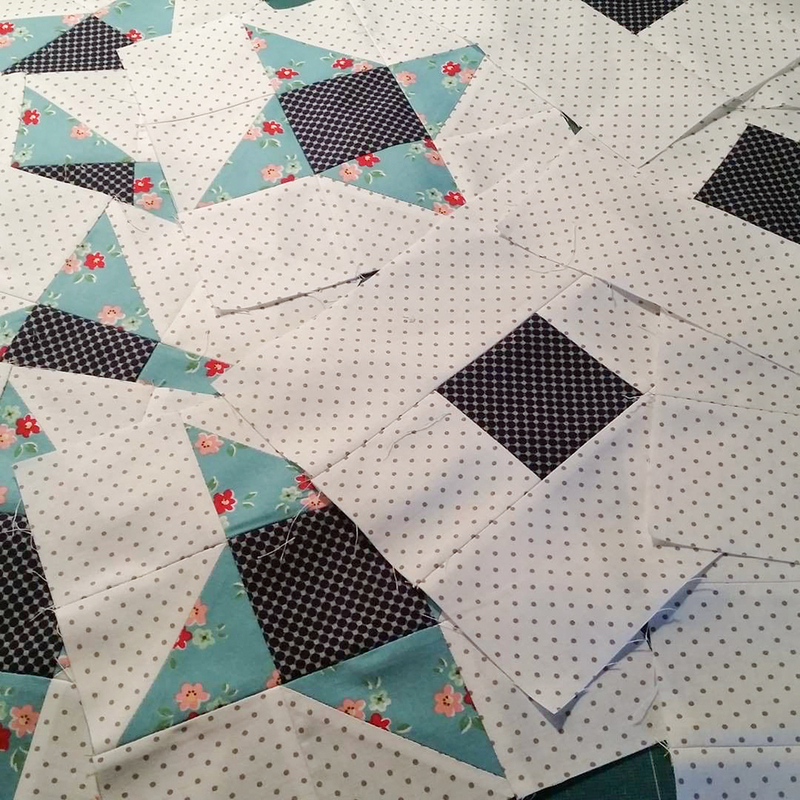 Everyone contributed blocks and I had the privilege of assembling the quilts. 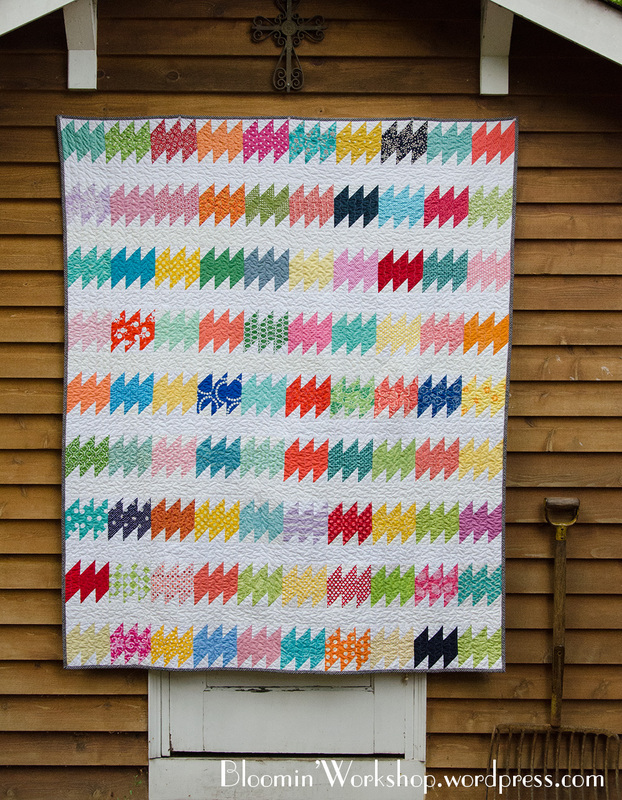 The above quilt was made with scraps of all kinds, including a variety of whites on the front, which is hard to see. The backing was from my stash. 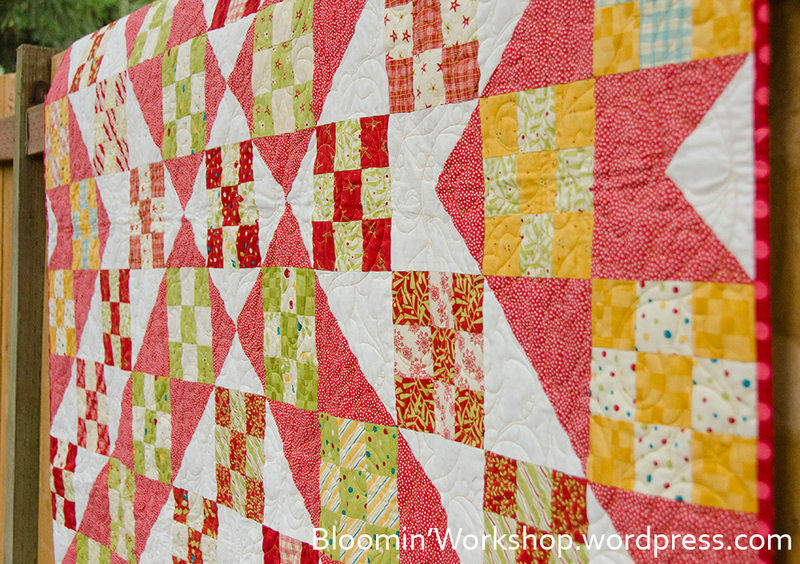 I used a wavy zig zag line to quilt the quilt. 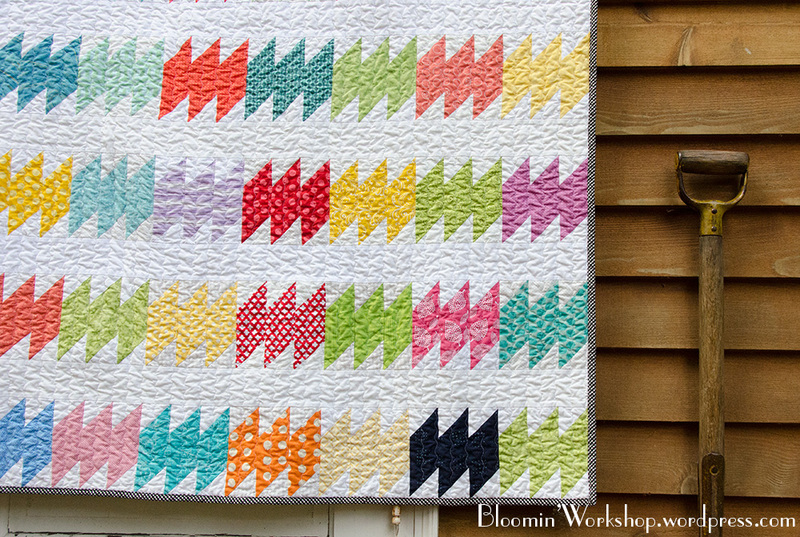 I love the texture that is created from this stitch and it is a quick way to finish a quilt. 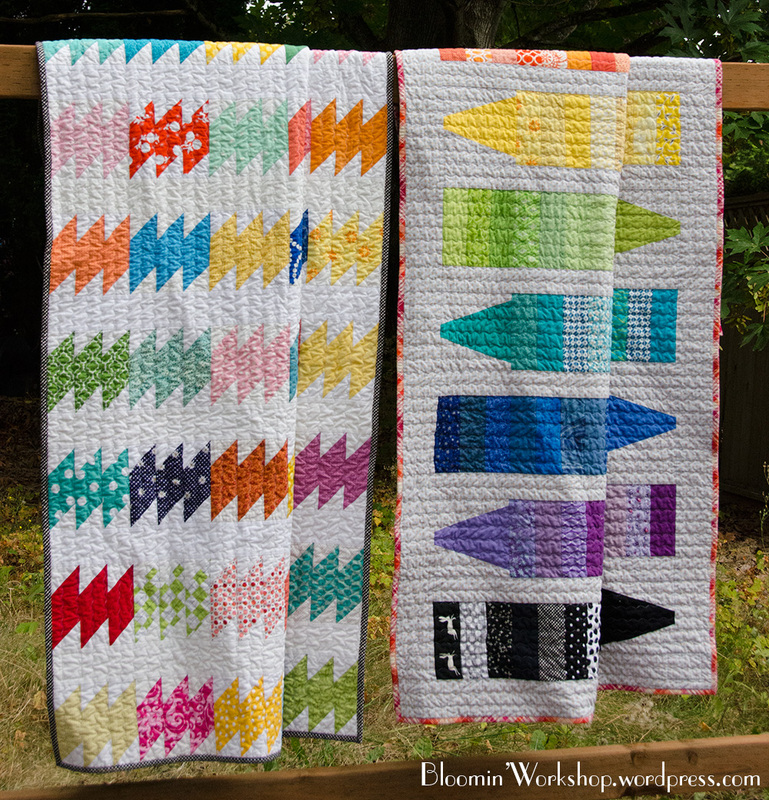 For the second quilt, everyone made scrappy color coordinated rows and then I added the triangle block to make them look like crayons. The sashing and the backing were sale fabrics at my local quilt shop, Circa 15. One unfortunate postal event led the last row to be added to the backing before finishing the quilt. Thank you to everyone who contributed to these quilts! Both quilts will be donated to a local YWCA chapter that aids women and children in need and distress. Hi. I'm Anita. 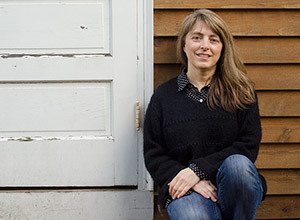 I like vintage textiles, old houses, fresh bread, and dinner under the pergola. And... I like making things. Thank you so much for visiting! Please be kind and do not use my photos or content without prior permission. 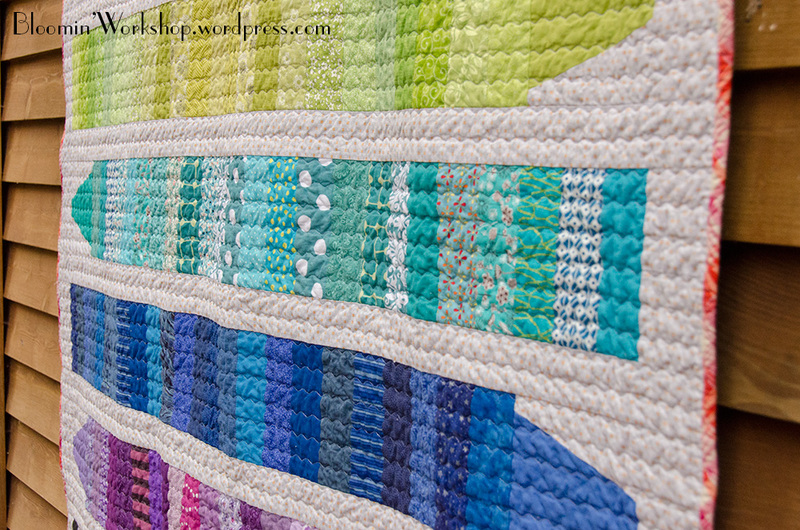 It takes as much time and effort to create a blog as it does to create a quilt. Jesus said, “ Come to me, all who labor and are heavy laden, and I will give you rest. Take my yoke upon you, and learn from me, for I am gentle and lowly in heart, and you will find rest for your souls. For my yoke is easy, and my burden is light."